Carved in teak, overlaid with black thitsi-lacquer (Melanorrhoea usitat) and gilt. Partly decorated in the relief moulded thayo and glass inlay hman-zi shwei-cha technique. This image depicts the standing Buddha dressed in the robes of a Burmese monk - open mode of bare right shoulder with a partial covering by the third garment falling in cascades down the front and ending in voluminous folds which his hand holds open on his left side. His right hand is placed across his chest. His hair, the sparkling fillet and unisha resemble a close fitting cap finishing in a bulbous finial. He stands on an open lotus bud which is in turn supported by an elaborate sparkling waisted octagonal base. 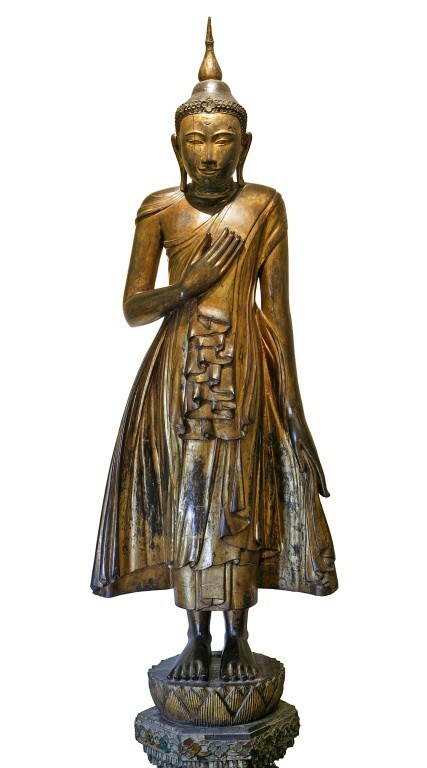 Burmese teak lacquered and gilded Buddha. Konbaung Dynasty (1752-1885). Depicted standing in monk's robes on an elaborate base partly decorated with mirror work, late 18th/early 19th century. Clarke, John: Arts of Asia, vol. 45, no. 5, September - October 2015, "The Buddha image in Asia: Phase One of the Robert H. N. Ho Family Foundation Galleries of Buddhist Art", p.119, pl. 11.
the gesture of compassion, or maha karuna mudra. 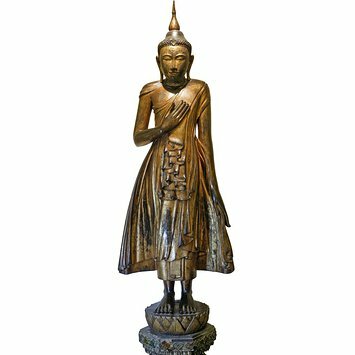 This sculpture was reportedly obtained from the Moulmein Pagoda in Amherst, between 1840-1845 by a captain in the sevice of the East India Company. This may have in fact been the Kyaikthanlan Pagoda at Moulmein which R. Kipling famously described as the Moulmein Pagoda.